Over the weekend of November 17 and 18, the community of Batey Libertad was treated to a visit from a Haitian national hero … in fact … the Haitian Athlete of the Century! 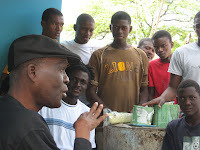 Emmanuel “Manno” Sanon — who lead Haiti to the 1974 World Cup — shared his coaching and playing experiences with the soccer teams, attended a graduation of a “Futbol para la Vida” HIV/AIDS education program, and hosted a soccer tournament at Batey Libertad. Footballers and fans alike spent hours with Manno, discussing soccer, autographing t-shirts, or just reflecting on the future of Haiti and the powerful voice of the Haitian diaspora in the Dominican Republic. Manno’s name was forever preserved in soccer lore when he scored one of the most memorable goals in World Cup history against Italian keeper Dino Zoff. Scoring nearly half of the national team goals during his four years playing with Haiti, Manno went on to play professional soccer in Europe and the USA, has had an illustrious coaching career in the USA, and most recently coached the Haitian national team in the 1999-2000 season, including their first CONCACAF Gold Cup appearance. Manno today lives in Orlando, Florida with his wife Susi, and has been busy running the Foundation Emmanuel Sanon (FONDESA), a 501(c) non-profit and charitable organization that provides activities for youth of North American, the Caribbean, and Europe. 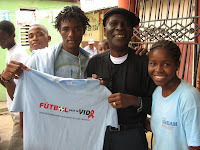 Manno has recently become the ambassador for Futbol para la Vida, our HIV/AIDS prevention education program with youth of the Dominican Republic and Haiti. 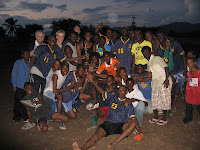 Together with a University of Vermont class, Manno hosted the 6th Soccer Tournament of the Batey Libertad Coalition. The tournament included Batey Libertad and three teams from neighboring Haitian communities. Fighting through the rain (at times torrential) the Batey Libertad men’s team won the tournament, with Manno presiding over the team trophy presentation. Vermont players included the father son duo of Lucas and Gary Hawley, and UVM medical student Ryan Sexton, who scored a critical goal during a qualifying round penalty kick shoot-out.